Do you have a craving for peanut butter cups? We all do! Here is a healthy alternative that is also delicious. 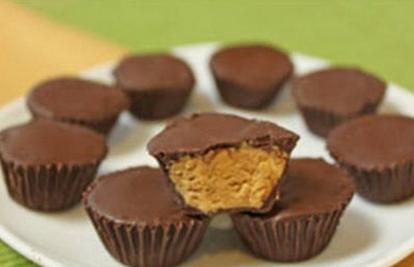 Shakeology Peanut Butter Cups. Step 1 – Preheat oven to 350 degrees. Place chocolate chips in a small oven-proof bowl and heat in oven for 15 minutes, or until melted. Step 2 – While the chocolate is melting, place Shakeology powder, psyllium husk, and pumpkin puree in food processor. Pulse until if forms a dough. Step 3 – Divide dough into 12 small balls and portion into each cupcake liner. Press dough down into a flat disk with depression in the middle. Place a 1/2 tsp of peanut butter into each depression. Step 4 – Remove chocolate from oven and stir to melt completely. Drizzle evenly over each cup and spread to create a thin chocolate layer on top (about 1/2 tsp of chocolate per cup). Step 5 – Freeze for 30 minutes or until chocolate hardens. As you can see from the numbers above, the Shakeology Peanut Butter Cups are almost a third of the calories of the original Reese’s version, and an overall better choice. Plus, you will have fun making these and sharing them with your friends, family, and children. How To Get Shakeology For The Lowest Price!